Manx Radio are incredibly excited to be working in association with one of this Autumn's most exciting events on the island! 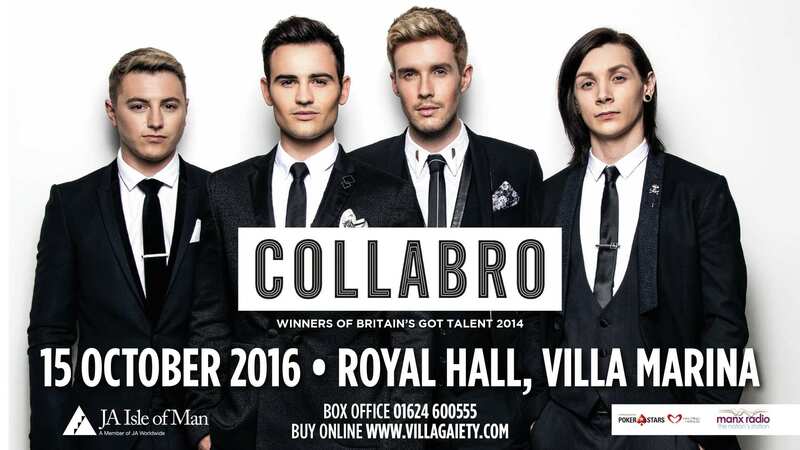 Collabro, winners of 2014's Britains Got Talent will be on stage at the Villa Marina on the 15th of October. After winning the show, the group have gone onto huge success, selling over 360,000 albums and becoming firm favourites of the public on their UK tour. They have played shows in America, Japan and Hong Kong, where they have been received with great demand for future shows. 2016 saw the boys embark upon another, larger tour, this time selling out venues such as London’s Royal Albert Hall. So, make sure to grab your tickets before it's too late by clicking here or head to the villa box office. Collabro, at the Villa Marina Is in aid of Junior Achievement, proudly supported by Pokerstars Helping Hands and in association with Manx Radio.